We are a thriving Club with over 50 members who enjoy the French national sport of Pétanque (Boules). But, did you know that the sport is played around the world by over 200 million people and is likely to become an Olympic Sport in Paris by 2024. Established in the centre of town at The Pierhead, close to Bettys Tea Rooms, our facilities are in daily use from March to October (and as weather permits though the winter) as a public facility for all to enjoy. Pétanque is a sociable sport for all ages and abilities, and it is very easy to learn how to play. It primarily involves natural hand eye co-ordination is the same way you learnt to play ‘catch’ with a ball, as a child. Yes you do need to have your own boules, or they can be hired from the Oxfam Shop, just down Montpellier Hill from Bettys, and open 7 days a week. – Members are also welcome to join in the U3A group that runs on Wednesdays from 14:00 to 16:00. The daytime sessions from the summer will continue to run through the winter, on a flexible basis and subject to the weather. Just check the BBC weather forecast online for the date and start time. If it’s “DRY” and “More than 8°C” it should be ON! Non-members are welcome to come along to a club session to have a ‘try out’. Best to get in touch first, using the online Contact Form so we have somebody to welcome you! Our ‘home’ dates from the late 19th century and was built as a viewing gallery over Montpellier Gardens. This was laid out as a glimpse of the Yorkshire Dales and there are still one or two limestone boulders in the borders below The Pierhead. Today it looks very different as a Bouledrome for Pétanque and laid out with 4 pistes (courts). These are about 13 mts long by 3 mts wide. There are two pistes in each terrain. Sadly, the need for total public safety in such a public area requires the terrains to be fenced off. That does not reflect on the accuracy of the players, but the risk of anybody deciding to take a short cut! Because of the nature of the surface, even a 700 gm boule will not bounce more than a few inches off the ground and one has never left the court in play. 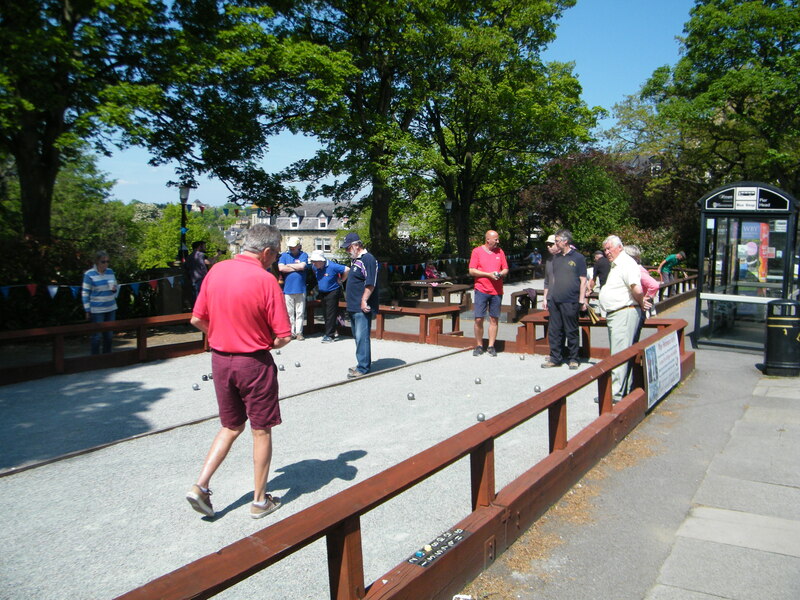 The Club’s primary aim is develop the sport of Pétanque in the Harrogate area. This provides a recreational activity for all ages and abilities within a highly sociable environment. There are few sports that are as accessible and sociable as Pétanque, and where you can be playing confidently within a few hours of coaching and practice. Many of our members have joined as a way of making friends and we have regular social events throughout the year. The Club has now grown and developed to be able to offer match play for those who wish to play competitively against other clubs within the Northern Pétanque Association region – the North of England. We are also keen supporters of Saint Michael’s Hospice in Harrogate, and have raised over £400 this year. We are able to keep our annual Club membership fees low thanks to our sponsor, the Ellis Bates Group, who not only funded the material cost of building the playing area at The Pierhead, but also contribute to our annual administrative costs. The Pierhead is a public facilityand is available to all with their own boules, or available to hire form the local Oxfam Shop about 50 metres away. So, why join the Club? You can extend your participation to competitive play against Clubs across the North of England.